Whether you’re looking for style inspiration, quirky gift ideas or perhaps some fresh, up-and-coming designers to stock in your boutique store, Pulse London have got it covered. 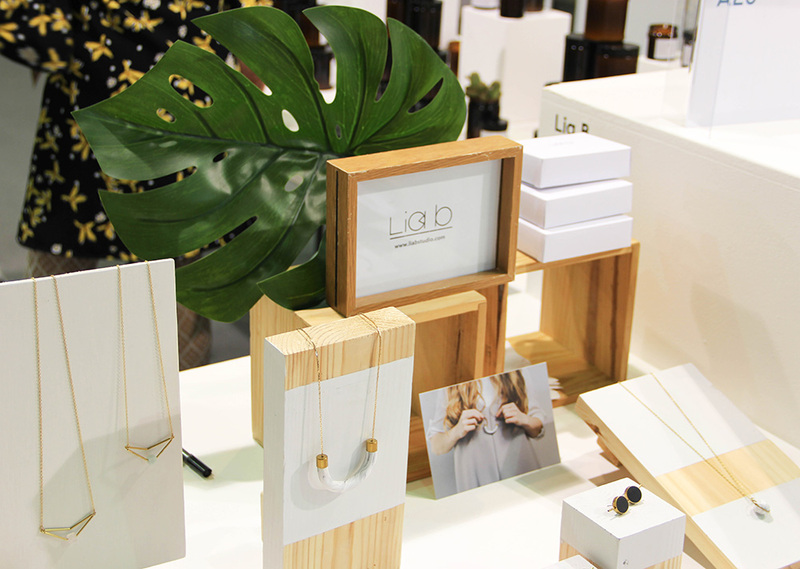 Situated at the business centre in Kensington Olympia, London’s annual boutique trade event returned this year with a new army of undiscovered designers, ready for breaking the boundaries of design. The pop-up stands revealed a range of products from timeless fashion pieces, to eccentric accessories, novelty homeware and a range of unusual lifestyle pieces. That’s the beauty of boutique trade fairs: you never know what you will come across because no two brands are ever the same. A new business venture awaits you on every corner. Avoid the clichés of high-street fashion and gain some original inspiration from some of the most passionate, emerging designers from the international fashion and homeware industry. Stepping foot into the open-plan trade fair, the room was flooded by natural daylight, which beamed through transparent roof, making the room incredibly bright and airy. It was heavenly! Pristine white carpet covered the floor: it was a haven of minimalism and I felt almost on edge walking on it with my mud-caked shoes. I prayed that I wouldn’t leave behind a trail of embarrassment as I worked my way around the trade fair. The bustling boutique fair had a lively ambience and everyone- exhibitors, press, buyers and even the staff- seemed to be enjoying themselves. Pop-up stores were divvied up among the aisles in a scattered formation. A tiny paper map was our only way of navigating this maze. It was much like trying to navigate yourself around a strange supermarket – obviously minus the dodgy-wheeled shopping trolley that makes you par-take in a game of bumper cars with other shoppers. Instead it was more like bumper-bodies; bumping into other visitors whilst squinting to try and decipher the words written on the tiny sign posts that were overhead. Exhibitors stood proud by their pop-up stores, luring passers-by to their stands, talking about all things business-related. Catherine Colebrook, a blossoming British designer for homeware and lifestyle products, was one of our favourite designers at this year’s boutique trade fair. 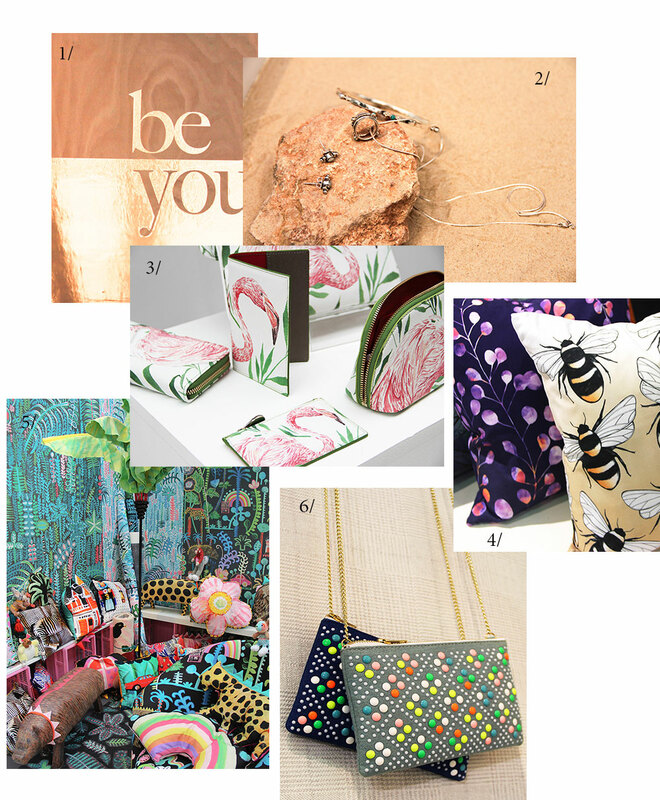 The burgeoning designer creates framed wall art, quirky tea towels, novelty mugs and conventional make-up bags. Her pop-up really stood out to us as we ambled up and down the aisles. Black and white borders framed some of her personalised wall art, combining laminate flooring-style material with metallic gold animal print stickers layered on top. It was an extremely unique idea and unlike anything we had seen before. Ideal for filling an expanse of lifeless wall space, this custom made wall art is perfect for sprucing up your home. It would even be quite nice as a gift. Her range of tea towels, encouraging avid cooks to ditch their limp, lifeless tea towels- that drain the life and soul out of any kitchen- for a humorous new one from her humorous collection. Some of the quotes printed on them read “God save the wine” and “Tonight’s forecast…99% gin”. To be fair to her, she’s got it right: the forecast for tonight is 99% alcoholic. Fascinated by sewing, fabrics and textiles when she was a little girl, Catherine’s love for creating things quickly blossomed into a promising business venture. Channelling her passion for design and textiles into a career, she has created a number of timeless homeware pieces. However, it wasn’t always a plain sailing career in design for Catherine. She began a career in nursing shortly after the medical drama, Casualty, was aired and carried it on for 15 years. After being cast as an extra in a few episodes of the hit TV series, she decided that it was time for a career change and time to pursue her passion for fashion. She has been designing timeless, classic homeware pieces since 2006. Passionate about supporting British manufacturing, Catherine ensures that all of her products are sourced and produced in Britain. Charlotte’s Web was founded by the free-spirited, well-travelled Charlotte Howarth. Inspired by the different cultures and landscapes that she experienced on her travels, she has crafted an impeccable collection of spinning jewellery. The simplicity and timelessness of her collections add elegance to any outfit. The silver jewellery was displayed in a cabinet which was blanketed with fine beige sand on the bottom: jagged rocks were dispersed on the top. With jewellery draped over the rocks in a mermaid-like fashion, it suggested that it would look beautiful with a summery kaftan, on a luxurious beach in the Bahamas. Charlotte recently moved away from the rain-mobbed landscapes of Great Britain, in exchange for an exotic life in sunny Ibiza. Her new life overseas provides her with plenty of inspiration to keep her creative juices flowing. A seemingly beautiful brand at the heart of international fashion. Designer Ceylan Kolat founded her colourful lifestyle brand, Fonfique, in 2014.The Turkish-born designer studied fashion design in Milan and continued her studies at Central Saint Martins in London. This brand combines practicality, beauty and function into a single product. Her hand drawn, nature-inspired illustrations each represent a different set of emotions and values. The pop-up at Pulse displayed a range of printed clutch bags: the Dalida clutch in Flamingo was our favourite. The striking pink and lime green colours perfectly completed the minimal, white leather bag. Inspired by the flora and fauna nestled amongst the British countryside, Jessica creates an array of products including cushions, notebooks and jewellery. Her designs are particularly inspired by the beauty of British nature that can be found in some of her favourite rural locations. The creative entrepreneur is conscious of waste and goes to great lengths to use recycled materials where possible. Jessica experiments digitally with drawings, colours and textures, to create a stunning collection of botanical prints that are used on a variety of her products. The vibrancy of colours and patterns on her display table of plumped cushions was incredible. Anyone would assume that these vastly different patterns would clash when put side-by-side, but somehow these beautiful printed cushions worked so well together. Ambling down the minimalistic white aisles, our eyes were suddenly met with an insane rainbow of colour. Vibrant blow-up flowers, tall emerald green palm trees and swatches of printed wall paper, created a heavenly tropical forest. Our favourite print was the lagoon wallpaper; bursting with different shades of green, with hints of pink and blue, it is certainly the wallpaper to brighten up your lounge. The vivacious interior designer spent twenty years in London. Lucy’s natural aptitude for fusing colour and unusual materials racked up a staggering interest at this years trade fair. Her bohemian designs are second to none. Tell me, have you seen anything like this before? Replicating the 70’s fashion of little girl’s toys, Play Purse products add a funky edge to any outfit. A number of clutch bags in different shapes, sizes and vibrant colours were displayed at the trade fair. The bags, decorated with a variety of coloured beads, were assembled into geometric patterns of butterflies- some of the handbags were finished off with white tassels. Neon pink and yellow plastic stands were used to hold these beautiful bags. The geometric, fabric background that covered the back wall of the pop-up added to the retro feel of the stand. These handmade products are limited edition so you better get in quick and bag yourselves one of those retro beauties. Read our interview with the founder of Play Purse, Georgia, in Estila Edit 16. Pulse London is all done and dusted for yet another year. But what a weekend it’s been. It has been great to celebrate the progress of some of the best up-and-coming designers and seeing how breaking the boundaries of design is making a difference in our lives. We’ll see you in 2018 with another panel of emerging designers, who will be breaking the boundaries of design yet again I’m sure. Credits: Text and photography by Sophie Parrott.